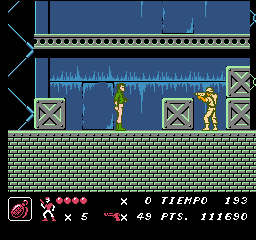 Code Name: Viper is an action platformer game for the Nintendo Entertainment System. 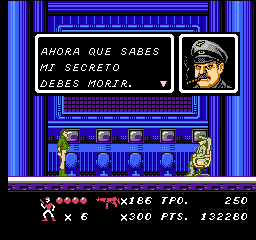 Originally released in Japan as Ningen Heiki: Dead Fox, the game consists of destroying the drug syndicate located in South America. 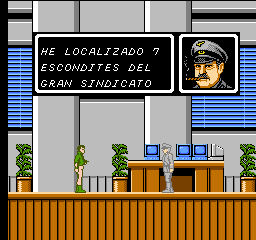 The player is called Kenny Smith or known as Mr. Smith (the game) which is sent by Commander Jones in order to rescue the civilian hostages and an agent who has information about the author who smuggles the drugs and also It gives you a bomb to go to the next level. You must go through the 7 hiding places of the great drug traffic. As you save the wounded agents, it will give you clues about the real author and kill him. 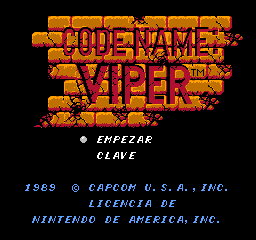 This is a Spanish translation of Code Name: Viper for the Nintendo Entertainment System.